Easily the most common excuse I hear from people who don’t eat breakfast is that they don’t have time. While it’s great if you get up early enough to make yourself eggs and toast, most of us set our alarms so that we get to sleep as much as possible. This means we usually only have enough time to get ready before needing to dash out the door, forgetting to eat anything. While you may not have time to sit down to a bowl of cereal every morning, there are tons of great on-the-go breakfast options. Think you need a kitchen? Wrong. That microfridge is your best friend in the dorm. 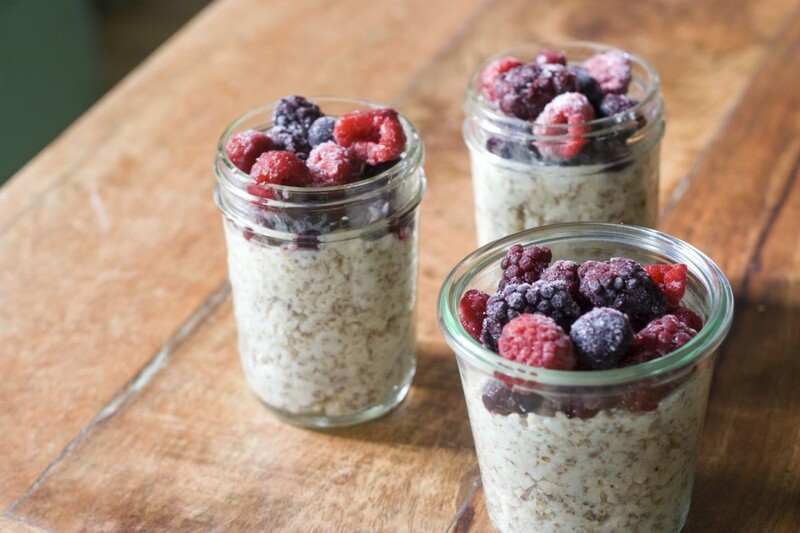 Here are some dorm and apartment-approved breakfast on the go ideas to get you started. Make your own yogurt parfait. Use either our delicious Sargent Choice recipe or make up your own mix of yogurt, fruit, and cereal or granola. 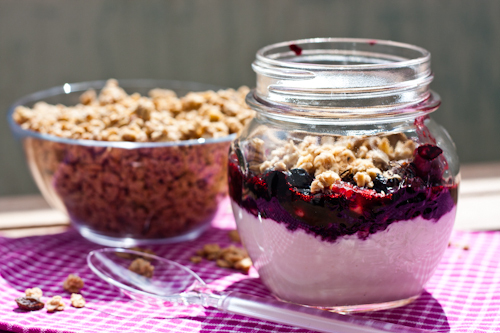 Put the yogurt and fruit in a jar the night before so that all you have to do in the morning is add the cereal/granola and go. Oatmeal. All you need is a bowl, water, and some fruit or honey to add some sweetness. To make it on-the-go, pop the oatmeal in the microwave while you’re getting ready. Then before running out the door, pour it into a mason jar or thermos, grab a plastic spoon, and pack it in your bag! Peanut butter and banana sandwich on whole wheat bread. While peanut butter sandwiches are usually thought of as lunch foods, they not only taste delicious for breakfast, but also will keep you full for a while and are very easy to make the night before. A bar and a piece of fruit. While bars such as Luna Bars or Nature Valley bars aren’t ideal, they’re better than nothing. Aim for a bar with less than 12g of sugar and at least 3g of fiber. Also pay attention to the ingredients list, looking for bars that have non-processed, whole foods, such as LaraBars. Even better: make your own no-bake breakfast bars. Smoothies are ideal for on-the-go breakfasts. A great tip I overheard once: spend one day or night making a bunch of different kinds of smoothies, then freeze them individually, so all you have to do is toss it in the blender and go. Try a Sargent Choice Berry Mango or Purple Power Smoothie or browse through Happy Healthy Life’s extensive smoothie list. Make an oatmeal bake and save the leftovers in the fridge for the week. By having baked oatmeal already made, all you need to do is pop a serving in the microwave while you’re getting ready, then place it in some tupperware to eat when you get to class or work. Try this Baked Apple Pie Oatmeal recipe or this Baked Blueberry Oatmeal recipe. While coffee house muffins are really just slices of cake in disguise, a homemade muffin can be a wholesome breakfast by using oat flour or whole wheat flour, reducing the sugar, using healthy fats, and mixing in fruit. Have a few minutes to spare before class? Head over to Breadwinners in SMG or any on campus Starbucks and grab a Sargent Choice Yogurt Parfait or Sargent Choice Muffin to go.